Make the right choice when shopping for your next ride with the Rider's Choice Asym Wide Snowboard from GNU. This men's snowboard features rocker between the feet with camber beneath the feet for the freedom of the freestyle board with the carving ability of an aggressive all-mountain board. The board is asymmetrical to help enhance heelside turning to make this board move more naturally beneath you. A sustainably harvested core of balsa, aspen and paulownia wood for a lightweight ride that is responsive and aggressive, and is reinforced with fiberglass to provide stability. Recycled sidewalls are not only environmentally friendly but also incredibly durable and waterproof to protect this board's interior. Magne-Traction edges bite into hard snow and icy conditions to help you hold an edge at high speeds. With a sintered base, it absorbs wax extremely well to help you ride faster and more aggressively. 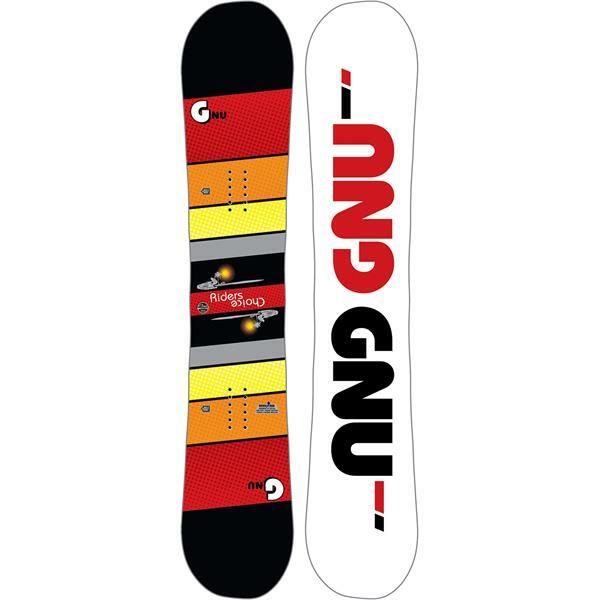 Perfect for advanced-expert riders with larger feet looking to tear up the park and occasionally hit groomers, this snowboard from GNU is a must-have addition to your winter set up. Turns are insane. Park is great. Flex is good. All around great mountain board, wide is necessary if your boot size is above 10. This is my second d GNU, originally I had the park pickle from 2008 (156W) and it was sick, I rode that for about 8 years. The riders choice reminds me a lot of it, but the asym is unique and amazing for holding down turns. I would recommend this board to anyone. The Riders choice are great boards that deserve more attention and respect then they get. I wish I had one of these 20 years ago when I rode everyday in all conditions... I have one now for spring park days or non powder days. Litterally the best board I ever purchased ! Verry forgiving, verry stable on packed snow, flawless in powder..... this one I will keep for a looong time !! The one board that can do it all! Great board for all mountain riding, deep pow, switch, park laps, rails, and pipe! Im an AASI cert 3 instructor and woodward coach this is my main deck that can handle my aggressive everyday riding style. My one compliant is the top sheet, my deck looks like it made it to round 5 in the UFC Title fights. So maybe give it a matte finish or some texture on the top? Overall, though defiantly one of the best boards I have ever ridden on. I highly suggest grabbing this deck! first time i did a demo felt in love with it, didn’t want to try any other board after. I use it groomed slopes i dont think there is better board out there then this. Thank You GNU for this master piece. If your boot size is larger than 11 then you should get a wide board.